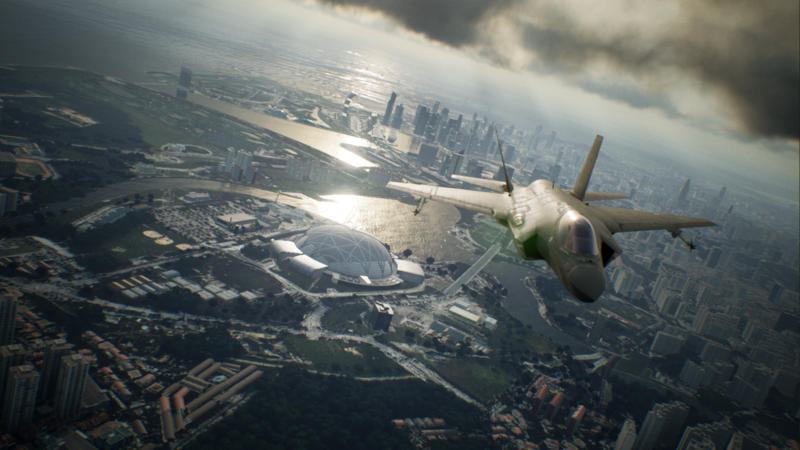 I finally beat Ace Combat 7’s single-player campaign the other night, and the whole experience is indeed a fine addition to the franchise. 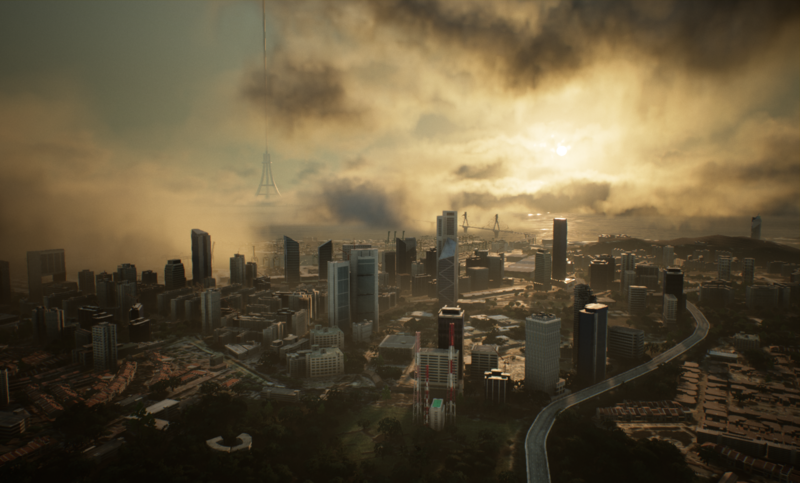 Today I thought we’d talk a bit about the mechanics and controls of the game, including where it fits into the overall franchise from this perspective, and into the broader concept of “flight simulators” as a whole. Suit up and get ready, pilot; it’s time to scramble. The Ace Combat games have always straddled something of a fine line between arcade action and more realistic simulation. Typically, they incorporate two different possible control schemes: “Normal” controls, as they are referred to here, handle like one of the old Rogue Squadron games — push left to turn left — while the “Expert” setup makes use of more realistic bank, pitch and yaw controls for greater flexibility. Many Ace Combat veterans believe that you’re not playing the game “properly” unless you’re on the more advanced control scheme — which has been positioned in various different ways over the years — and while I’m not 100% on board with the idea of demeaning people for making use of an option that is right there from the start (and positioned as “normal” in this game!) I have to agree that the series has always provided a consistently superior experience if you jump right in and play it like a “proper” flight simulator. Series producer Kazutoki Kono agrees; he even called out IGN for only making use of the easier controls in their video review. With all this in mind, the rest of my commentary on the game’s mechanics will be from the perspective of someone who has spent time almost exclusively with the Expert control scheme. Just so you know. I grew up with military flight simulators. They’re not really a “thing” any more, with a few notable exceptions on PC, but they were a defining part of my gaming life growing up. Spectrum Holobyte’s Falcon series, Digital Integration’s Fighter Pilot, MicroProse’s F-19 Stealth Fighter and F-15 Strike Eagle… all of these were games I played, loved and, surprisingly, understood as quite a young child. My father, as a bit of a propellerhead (to put it mildly) has always been interested in flight simulators of various types, so we received a lot of review copies of these games for the Atari 8-bit and ST. Dad’s main passion was in subLOGIC’s civil aviation simulation Flight Simulator II, however, which subsequently became Microsoft Flight Simulator on DOS PCs from its third full release onwards. I found the contrast between the military flight sims I played and Flight Simulator to be quite obvious. While Flight Simulator demanded care, attention and precision, most of the military flight sims out there allowed you to fling your craft around the sky without too many consequences — some later games incorporated things such as gradual loss of consciousness due to G-force (G-LOC, which is where the name for Sega’s After Burner follow-up came from) when making tight turns, but for the most part, these “realism” options tended to be off by default. Ace Combat, since my first encounter with it on PS2 a couple of years back, has always reminded me of those military flight sims in that it’s accessible, but has a huge amount of depth for those willing to put in a bit of time with it to learn specific techniques. You don’t have to worry about things like G-LOC, but you do have to worry about things like speed, altitude and, for the first time in the series this time around, weather. More on that when we come to talk about the actual combat next time. With the Normal controls, you are very limited in how much you can manoeuvre your plane. Since pushing left or right in Normal mode simply turns in that direction, you can’t deliberately roll your plane into a 90-degree turn and pull back on the stick to “break” — an important method for missile evasion. Nor can you do a proper barrel roll — either by the (incorrect) Peppy Hare definition, or by the actual definition. With the Expert controls, however, you have a full six degrees of freedom, opening up the possibility to perform a wide variety of aerobatic techniques. The game doesn’t explicitly teach you specific manoeuvres such as the Immelmann Turn, Split-S or Pugachev’s Cobra, but you’ll probably find yourself naturally doing them with Expert controls — whether or not you know the name of the manoeuvre while you’re pulling it off. Done a half-loop upwards and a half-roll to turn around quickly? You’ve done an Immelmann Turn. Done that but going downwards instead (scary!)? You’ve done a Split-S. Pulled your nose back and used your air brakes to screech to a “halt” in mid-air, causing a pursuer to go sailing right past you, at which point you drop your nose and fill their arse full of machine gun fire and/or explosive devices? You’ve done a Pugachev’s Cobra. 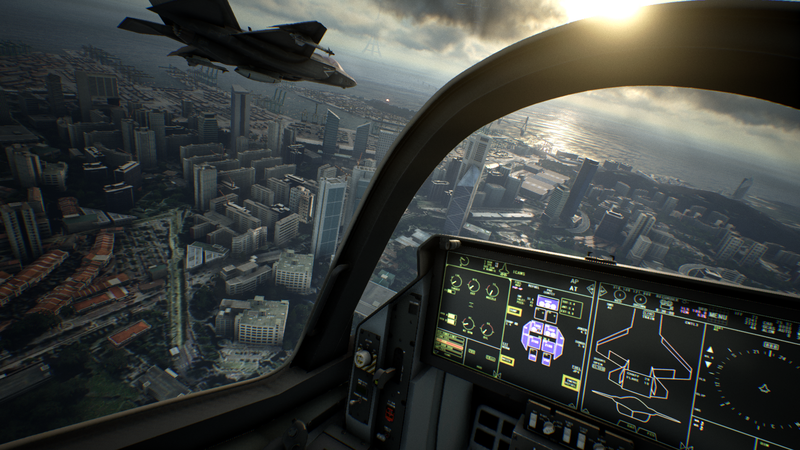 Okay, that last one you have to make a bit more of an effort for — according to people with a better understanding of flight dynamics than me, Ace Combat 7 is the first title in the series where you can reliably pull off post-stall manoeuvres such as Pugachev’s Cobra with any degree of consistency — but I’m willing to bet anyone using Expert controls has done both an Immelmann or Split-S at one point or another. Just, uh, watch your altitude before you start the latter. One area of control where Ace Combat does differ from those flight sims that I grew up with is in acknowledging the rudder exists — and indeed making good use of the rudder being a key part of surviving a number of situations throughout the game. For those less familiar with the way planes work, the rudder is a means of “yawing” the aircraft — turning it from side to side without it rolling in either direction — and is often used in conjunction with rolls to make tighter turns, or by itself to make fine course adjustments for flying through narrow environments or lining up unguided shots carefully. Those old flight sims tended to ignore the rudder for simplicity’s sake — they tended to use a single-button controller plus a computer keyboard, so there wasn’t an easy means of implementing those controls in a comfortable, easily accessible manner. Ace Combat, however, allows you to yaw the plane easily using the shoulder buttons on the controller, putting rudder use quite literally at your fingertips. And indeed there are a number of missions in the game where the rudder will likely help you more than banked turns — a perilous stealth mission through a canyon, for one, and the obligatory “tunnel mission” later in the game for another. The rudder is also extremely useful for lining yourself up in the optional landing sequences that close off a number of missions — it’s much easier to keep an eye on how well you’re lined up with a runway or carrier if you keep your wings level! 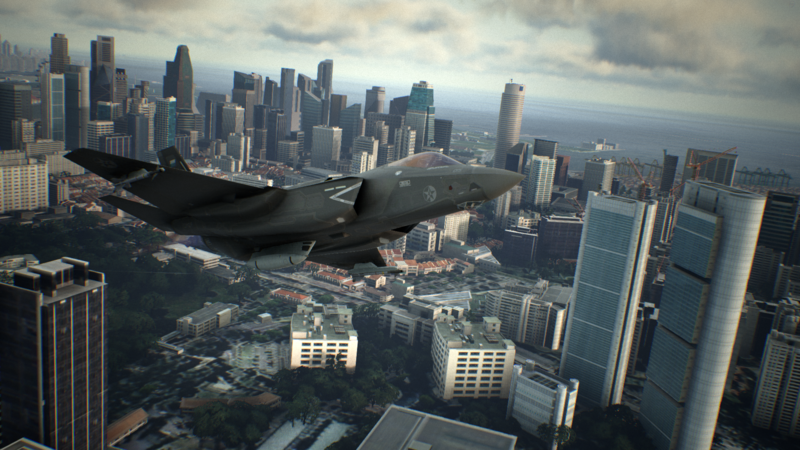 Ace Combat 7’s acknowledgement of the basics of flight dynamics while deliberately ignoring those things that would make them less fun — most notably the effect of G-force on the pilot — allows it, like its predecessors, to successfully walk that fine line between arcade thrills and convincing simulation. 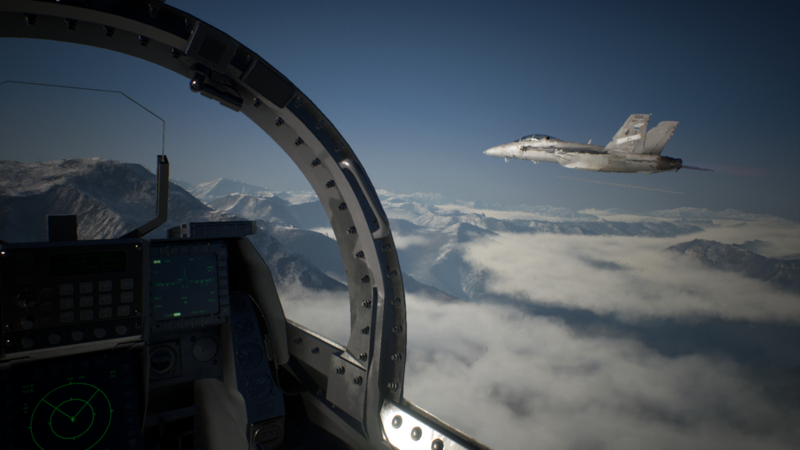 No-one’s going to be using this game for military training — but it’s convincing enough to make you feel like a real ace pilot. Which is exactly what anyone going into this sort of experience likely wants more than anything! Next time, we’ll take a closer look at how the game handles combat — and how this is another area where it blends realism with arcadey “suspension of disbelief”. I would like to give this a try sometime, but your mention of F-15 brings back memories! I still have that on my NES, but I’m sure it won’t hold up nearly as well these days. yeeeeeah. But “DO AN AILERON ROLL” doesn’t quite flow off the tongue as delightfully now does it? lol. Especially if you’re doing it in the requisite American Southern accent. Just “do a roll” would be fine! “Roll with it!” “Rock and roll, baby!” Stupid rabbit.